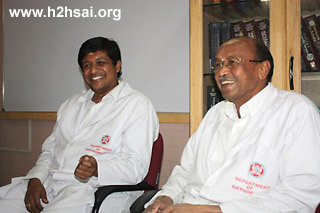 The story of how Mr. Narayana Reddy, an adult breadwinner of an underprivileged family, who had almost become an invalid because of a fateful accident and the resultant terrible damage to his right hand, received virtually a new lease of life, thanks to Divine Grace and the ingenuity of the doctors at the Sri Sathya Sai Institute of Higher Medical Sciences, Prasanthigram. This tale will open your eyes to the wonders that silently unfold every single day in Baba’s Hospital, where the subtle ‘hand of God’ is always at play in so many mysterious ways. It was twilight when Narayana Reddy, a resident of Surarana Palli, a village on the side of the highway connecting Anantapur to Bangalore, started for Penukonda on his scooter. Just a few kilometres from his home, he witnessed a van coming from the opposite direction lose control and come right at him. Reddy in a last ditch effort to save himself screeched his scooter to the left, but the van seemed to follow him. Eventually the van crashed into the handle bar of his two-wheeler, throwing Reddy off the vehicle. When he came about, Reddy realised he was in an ambulance and an excruciating pain shot up from his right hand. Reddy’s right hand was an awful sight. The palm was detached from the wrist, hanging to his hand only by the skin. The bones had pierced the flesh and were protruding, while blood flowed in streams. Walking away from a deadly crash with some bruises but a broken wrist, Reddy thought he was fortunate. But it was not all that simple. Reddy was rushed to a Penukonda hospital. “They did the dressing and told me that everything will be fine. The wound also healed. But when they removed the bandage I saw that my hand looked almost as grotesque as it was immediately after the accident. "There was a gap between the wrist and the palm. It looked terribly awkward and revolting; my palm almost dangled from the end of my wrist. It was only then that I realised that I could not use my hand any longer,” averred Reddy. Most of the chores that people do naturally, he could not. “I am a farmer and with the right hand rendered useless I could not carry out my work. I could not take a bath properly. I could not even eat with my right hand.” Reddy would hide while taking food in any social gatherings. “I could not hold a tumbler or even soap with my right hand. I felt miserable and was worried about the future of myself and my family.” It was Reddy’s committed wife who helped him to carry out his every little duty, personal and otherwise. Now, Reddy was not only an invalid but soon was in serious debt too. He owed Rs.80,000 (approx $1740) to many people, and his land lay fallow. Once a breadwinner, he now had become a burden on his family. Most of the doctors Reddy visited gave him little hope regarding the recovery of the damaged hand. A majority of them gave him a curt ‘no’, while the rest reluctantly accepted that even if he paid them the fat amount needed for the surgery there was only a slim chance that his right hand would become as good as it was earlier. A person known to Narayan Reddy then told him about the Department of Orthopaedics at the Sri Sathya Sai Institute of Higher Medical Sciences (SSSIHMS), Prasanthigram. He came to this Hospital, with only a faint hope that he would hear something different than what he had heard from many other hospitals. According to the Head of Department, Orthopaedics, at SSSIHMS, Dr. Kailash Rao, Reddy’s wrist was completely flexed in one direction and his hand was totally stiff. “It being his right hand, he was unable to do any activity,” he said. “He had intense pain in his hand and he was urging us when he came here, to help him out so that he could use his right hand and earn his living. Moreover, with him being the only earning member in the family, his family was completely dependant on his income. "The accident and the deformity it left him with, had made him totally disabled. He could barely open and close his right fist,” he added. ‘Handing back’ what Reddy had lost was going to be an extreme challenge. Another Orthopaedic surgeon at SSSIHMS, Dr. Vasuki explained, “This was a really challenging case for us. In fact, we had seen very few cases of such variety. "Even the visiting experts who were here were flabbergasted when they saw this case. They said to give a working hand to this man would be a real test of our skills; some felt it was simply impossible. However, hope came in the form of the Ilizarov method. 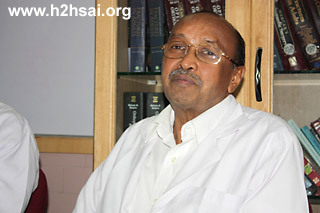 Both Dr. Kailash Rao and Dr. Vasuki were interested in this Russian way of treatment. “Where the rest of the ideas fail, this indigenous Russian system comes to the rescue; this method is completely different from the Western system,” Dr. Rao stated. In the Ilizarov system, invented by Prof. Gavril Abramovich Ilizarov, the treatment involves the use of rings, which are stationed by means of wires. These wires are passed through the bones and they hold the bones to-be-corrected by means of a ring. Providing the background of this ingenious method, Dr. Rao said that the Ilizarov method was an accidental discovery made by Prof. Ilizarov, and therefore the system was named after him. 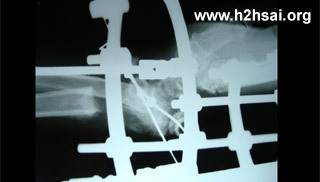 These rings and the wires will create a sort of tension on the bone as well as the soft tissues. 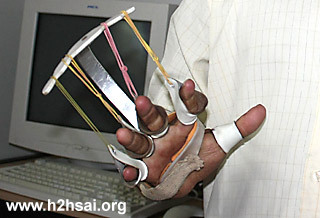 So by manipulating these rings, the surgeons can correct the deformities gradually. The tissues that would then form would be of right biological nature. According to Dr. Vasuki it is something like the formation of a baby in the womb of a mother. “Similar to the way a tiny one develops, the tissues in this method too develop. The process is called Neo-Osteogenesis, literally meaning, formation of new bones. The blood vessels grow, the nerves populate, the tendons multiply; every tissue originates and develops in the body. The distance between the rings can be differentiated by 1 mm a day. 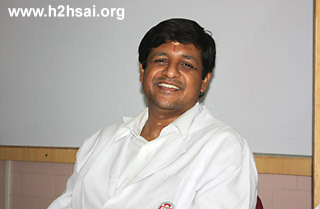 If we do it that way, all the body tissues grows automatically into that pathway,” Dr. Vasuki elucidated. Another advantage of this method is that it is a minimal invasive surgery. “We are not entirely cutting the body open to perform the surgery. We are introducing the wires through a very small stab incision in the tissues, which come out through the bones and then we tie them onto the ring with a certain amount of force. It distracts the tissues slowly, so when these tissues are slowly deflected, the natural formations of tissues occur. 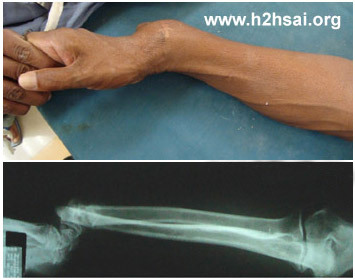 When the deformity is corrected, it is permanent with a natural formation,” Dr. Vasuki added. Talking about the efficiency of this procedure, Dr. Rao mentioned that an Olympic athlete who had fractured his ankle, received treatment by this method and went back to win the Olympic gold! “Most of the cases, which are dubbed untreatable, could be treated by this method,” Dr. Rao expressed. 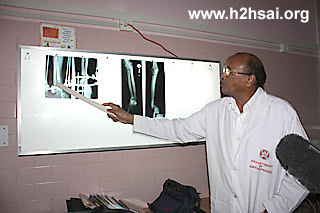 “The Department of Orthopaedics at SSSIHMS has been utilizing the Ilizarov method extensively. We have been doing this regularly, where a lot of deformed hands have been corrected, children with deformed feet have been set right; the limbs rendered defunct as a result of fractures, refusing to join, have been stitched; hands and feet, which have been short, have been lengthened, and the cases, which have been declared as ‘cannot be treated’, have been corrected,” said Dr. Rao, the committed HOD of Orthopaedics at Baba’s hospital. “In children, where there is a non union – where the bone that has not united with the leg by birth – you can give the child his/her arm and the leg only by this system. And those are golden cases for us because after the treatment the child comes running to us.” Dr. Rao is now visibly moved as he narrates this. To the question how this method came to be used so extensively at SSSIHMS, Dr. Rao answered: “I am lucky that in 1997, by Bhagawan Baba’s grace, I was able to go to the place where this system was started. I was in Russia for about 10 days for an International Course. But by sure Divine Intervention, I was given an extension for three weeks and I stayed back. It is only Baba’s Grace that made me learn all this,” submitted the humble surgeon. Reddy’s hand is now working fine. 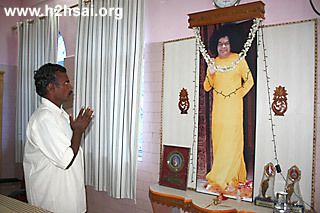 With a beaming face Reddy attributes the success of the procedure to the benediction of Bhagavan Sri Sathya Sai Baba. “We are indebted to Sai Baba for setting up such a Hospital. The greatness of Baba’s Hospital is that irrespective of patients’ social standing, race and religion, all are treated equally. Reddy expresses emphatically and emotionally. and hospital staff. He shares in Telugu. When his hand was out of action, Reddy was unable to go to work for almost one year and as mentioned earlier, his debts only continued to multiply. “I was worried that I might have to go on like this forever. But the doctors at this hospital have given me a new life. Now I am able to lift 5 kilograms with this hand! I am able to bathe myself. Soon I will be able to carry out farm work as well without any difficulty.” Reddy’s joy knows no bounds as he smiles heartily at the opportune turn of events. The eloquent Reddy is at his best when sharing his experience in the Hospital. This sacred home of healing has transformed his life totally and he is only filled with joy when asked to share his story. He thought he would be handicapped for life, but now it was as if God held his hands in the darkest hour of his life and has carried him from hopelessness and dejection to delight and a brand new life. He is simply overwhelmed with gratitude.